‘Failures are the stepping stones to success’. This is a quote most of us have grown up hearing. Right from the first steps we take to the very first job interview we give, failure could be waiting around any corner for us. But the difference is, as children we don’t really give into the pressures of failure, as much as we do as grown-ups. Taking this very keen insight into life as a basis for their new communication, Surf Excel and Lowe Lintas, the two players behind the much celebrated ‘Daag Acche Hai’ campaigns, have once again come out with another winner of a campaign. #HaarKoHaaro is based on the spirit of learning from failure and eventually defeating it. In the ad film, we see a group of adults and a group of kids trying to walk across a log. While both the adults and the kids fall, only the kids get up and try again, employing different ideas and helping each other get across to the other side. The adults on the other hand give up when they see that they can’t achieve the desired result in the very first try. This campaign marks the next stage of Surf Excel’s brand journey where the brand philosophy transcends into the real world to help address a real parenting challenge. It is a seamless extension of the brand’s decade-long “Daag Acche Hai” philosophy by telling parents that if kids get dirty in learning to defeat failure, then dirt is good. 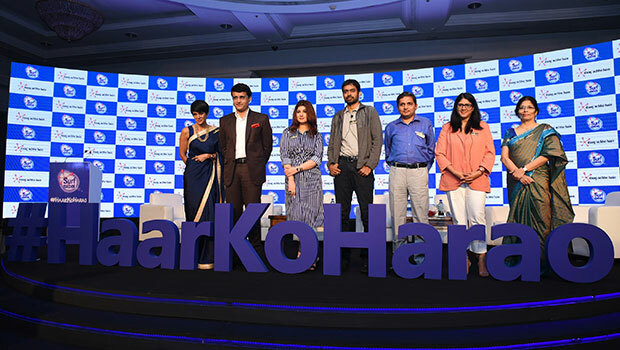 “The #HaarKoHarao campaign is an extension of Surf Excel’s decade-long ‘Daag Acche Hai’ philosophy. The campaign is rooted in a modern parenting challenge of helping kids cope with failure. In a society that is so achievement-oriented, a lot of kids struggle when they are faced with failure. As a society, our tolerance for failure is very low. We want to change that with Surf Excel and want to create a movement to change the perspective on failure to a learning experience. We intend to reach out to parents, teachers and society at large through this campaign because the change needs to be collective to make a difference. Today’s launch is only the first step in a multi-year journey through which we will engage with millions of parents in this space. We believe that if we do so, we will create a better environment for kids to grow up in,’’ said Priya Nair, Executive Director, Home Care at Hindustan Unilever Limited. Speaking about the thought behind the campaign, Arun Iyer, Chairman and CCO, Lowe Lintas, said, “We thought the best way to defeat failure, and all the stigma surrounding it, is to embrace the learnings that come out of it. Which is how the thought ‘HarkoHarao’ was conceived. The message we wanted to give out is, that if kids do fail, it is not the end of the world, but rather the start of a journey to find themselves." Surf Excel hosted a launch event with inspiring stories on defeating failure from Sourav Ganguly, former Indian cricketer and one of the most successful Indian captains, and Pullela Gopichand, former badminton player-turned India’s most successful badminton coach. The event also had Twinkle Khanna, film actress and now renowned author who spoke about her perspective on failure as a parent of two kids. The event also featured Preeti Kumar, Headmistress Poddar School, and Dr Harish Shetty, one of India’s most renowned psychiatrists in the field of child development. This was followed by a panel discussion where the panellists brought in their diverse experiences to bring forth the current societal view on failure and what it means for kids as they grow up. The discussion also had some interesting thoughts on what we can do as parents and a society at large to change this current perspective on failure from a judgement on a kid’s abilities to an experience that kids learn from. The panellists’ vision of the future was a pressure free and happier environment for kids to grow up in.